Flash: Still strong, but it probably won't be up as much as you need it since battles are constantly happening. Ignite: Nice to finish off unsuspecting opponents with heal and gives you an early damage boost, I like it, don't get it on long range poke champions though. Barrier: Nerfed, but still strong. Clarity: Not as useful as you might think with the increased mana regen. You might use it early game, but later on everyone will have enough mana if you build the right items. Cleanse: Eh...too many CCs, it'll never be up often enough to be useful. 2. Run to the upper left bush as fast as you can with your team and start preparing to invade the enemy bush. Generally, people like to do the second one since it's more fun. Last hitting isn't quite as important in this game mode, but of course any gold advantage you get will be good. On the other hand, if you see someone aiming for last hits, feel free to poke them down every time they go for a last hit. This will turn the tide in your favor. Late game it generally comes down to who has the better team composition. Make sure to time your deaths appropriately so that there's always someone healthy defending your base. If possible, always make sure to suicide during a time when the enemy team is all down. It isn't worth waiting for your health to regenerate after a big battle since you could simply die, re-spawn with full health, and use your new gold to shop! Both are very very good on this map for champions with small mana pools, but low CDs on their spells. Which one you pick is up to prefence, but unless you're an AD carry, definitely pick one or both up. 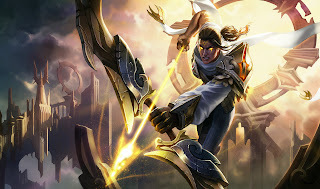 Even if you haven't been catching on to the black cleaver craze, DEFINITELY build brutalizer on your AD carries if you have long range poke like Ashe or Varus. You don't HAVE to start with boots, and in many cases, starting with a brutalizer (on heroes like Ashe or Varus) will be better. Starting right away with Sorc boots on certain champions like Annie or Brand is a pretty solid move. With heroes like Karthus or Cass you'll want to pick up some regen though. Ionian boots are viable on many more champions here than on summoner's rift. Use them if you want to spam more just beware since it's very easy to hit the CDR cap of 40% with so much gold coming through the game. Remember to die when it's safe to do so to go back and shop! Try not to feed anybody dangerous spree gold though. Okay, now that we've got the basics out of the way, it's time to go over some advanced strategies. I know some of you skipped over my entire post and scrolled straight here so I'll try and write something useful here and maybe you'll scroll up and read the rest of it. Okay, so this isn't the most mind-blowing #1 advanced tactikz you've ever heard, but I see a lot of people forget about this item. If the enemy AD is getting very strong, chances are if you pop some thornmails on your champions, you can turn a losing game into an easily winnable game. On summoner's rift it's generally better to group up so that you can come to the aid of your allies quickly. On ARAM it's much better to spread out on the map. The reason for this is that there's a LOT of poke that's going to be flying your direction, and for some reason people tend to crowd around the same side, which makes it much more likely for skillshots to land and do tons of damage. Nobody likes being the aura carrier, but with y'all tightly bound together, aura items are extremely powerful. While WOTA is nerfed, items like Aegis of the Legion are still very effective on this map. If you look to the bottom right hand side of the map you'll see this tiny gravestone, if you walk over with your hero...just kidding I'll add more strategies if I think of some. Feel free to post some below in the comment section! Shooting my way to victory!